No matter how long the trip is - a wedding weekend in Palm Springs or a two week trek through Patagonia - you’re going to need to carry things in a bag, and you might as well do it right. If you’re like me, packing and procrastination are good friends. Not a good combo when there is so much to consider: the type and length of your trip, weather expectations, the luggage you own, weight limitations imposed by your mode of transportation, and where you’ll fit the Malbec you plan to bring home from Mendoza. With so many variables in the mix, haphazard overpacking is the common folly. Don’t be a packing noob. Here are 5 easy tricks that'll help you master the art of packing. These bags have multiple benefits: they keep folded clothes organized and compressed, provide a separation between dirty from clean clothes, and if TSA has to rifle through your suitcase, packing cubes reduce the risk of something going missing. If you don’t have cubes readily available, roll your clothes and place them in bags by type. Shoes take up an uncanny amount of space in a suitcase, so try to reduce how many pairs you bring, and then pack them strategically. When appropriate, wear the largest pair of shoes on the plane so they aren’t wasting space in the suitcase. If shoes do not nestle together, as is the case with formal leather shoes, place them in separate shoe bags so you can play Packing Tetris. Take advantage of the space inside of shoes to hold smaller items such as rolled up socks, neckties or toiletries. Pack the heaviest items closest to the bottom of the suitcase (near the wheels), and the lightest or most delicate items closest to the top (near the handle). This is less about lowering the center of gravity, and more about ensuring your clothes arrive uncrushed and unwrinkled. There are times when I want a day bag to explore a city and don't want to use my carry-on laptop bag. Ideally it is something lightweight yet large enough to hold a water bottle, notepad, camera, sweater, sunglasses and a battery pack for my phone. I now keep a small foldable bag in my suitcase that weighs 0.5 lbs and takes up zero space. Depending on the time of year, I will pack a bottle of wine in my suitcase as a gift. The absolute best wine protector is the Vinnibag. It is reusable, lightweight, easy to use and has yet to fail me. And since it is clear, the TSA can inspect it without disturbing anything. Goodbye to the old-fashioned method of wrapping wine in plastic bags, cushiony sweaters and optimistic tomfoolery. 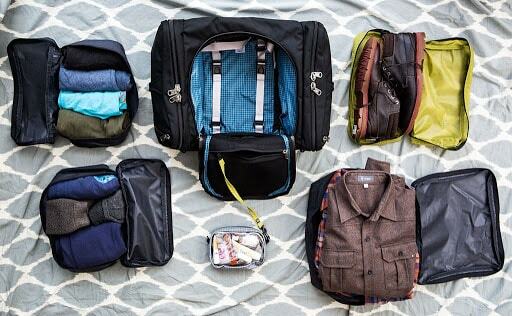 With these five hacks in the bag, you’ll be packing like a pro. There are a ton of other packing tips out there - what else should be added to the list? Would love to hear your favorites! NOTE: Sidewalk has not been paid to promote the brands or products mentioned in this post.